Massage therapy comes from ancient medical traditions passed among generations. As time passed, technology has also developed a means to mimic these soothing human movements and provide the relief of massage through various devices like massage chairs. The MAJ7 is a product of years of research by Panasonic, one of the global leaders in consumer electronics. This massage chair carries with it not just a well-known name in technology, but also Japanese expertise when it comes to design and engineering. Its brand alone assures you that you are purchasing something that you can trust. The Panasonic MAJ7 fuses traditional massage styles with advanced technological precision to give you a one-of-a-kind massage session. In fact, two of Panasonic’s latest patents (the REAL PRO ULTRA™ and Zengineered™ technology) are behind the MAJ7’s mechanism, resulting in this outstanding massage chair innovation. Its massage rollers can give you point-specific heat through their built-in infrared-powered heating elements. This gives an effect quite similar to a hot stone massage. In addition to these massage rollers, its Real-time 6-Position and Force Micro Processor can simulate a responsive massage therapy. Because of this technology, the massage pressure is detected real-time (at a rate of 100 times per second) by the system. This is comparable to giving feedback to your therapist to increase or decrease pressure in one spot. The MAJ7 massage chair employs a great combination of body scan technology and a unique massage system that covers three-dimensional space. This means that the body scan at the start of each session can create a virtual map of your back by means of pressure sensor technology. In turn, its massage rollers are able to massage the entire contour of your spine (starting from above your shoulders), with exact precision. Its 3D massage capability, on the other hand, gives every square inch of your back a deeper and more satisfying massage. To add variety, the quiet yet powerful MAJ7 has six preset and six manual programs for your various massage needs. You can opt for some light tapping massage and feel revitalized. Or you can loosen your stiff muscles with some soothing kneads. 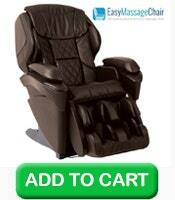 This massage chair can also simulate thumb-like pressure and perform deep tissue massage to calm your sore muscles. For spot massage, the Panasonic MAJ7 can work on your neck and shoulder, stimulating and soothing specific points in these areas. It can also address your hips, with its muscle-kneading, loosening, torso and pelvic technique. If you have middle and lower back aches, this massage chair also has a preset program dedicated to these specific areas. Meanwhile, if your glutes and upper hamstrings need attention, the MAJ7 also has advanced lower core massage that can address these areas’ needs. Relieve your stiff and tight hips as the air cells gently lift and reposition your whole body to target the right acupressure points. 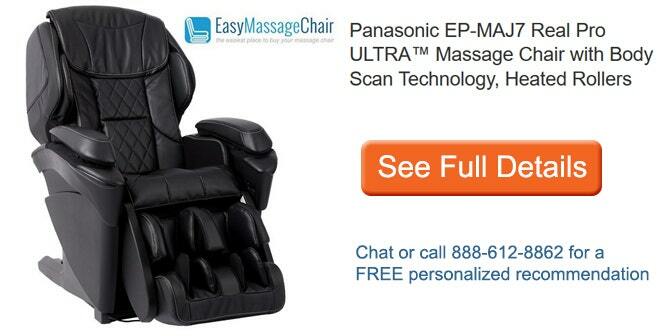 Lastly, the Panasonic MAJ7 can also provide you with a professional sole massage. The massage chair does this by replicating reflexology moves at the soles of your feet, while its full coverage air cells hold each foot in place. Other options for sole massage include a plantar arch massage, sole kneading, and sole shiatsu. If you want to have massage sessions that are tailored to your personal preferences, the Panasonic MAJ7 can also provide that for you. Gentle to firm settings are available, if you want to control each massage setting. Similarly, the intensity of the air cell compression, roller massage, and foot massage can also be programmed according to your liking. Similarly, catering to a custom massage experience, the MAJ7 allows for the favorite settings of up to three users to be saved on the massage chair’s system. A massage chair offering superior massage experience, backed by a world-trusted brand, and fueled by state-of-the-art technology, is definitely an excellent buy. With its line-up of impressive features, the Panasonic MAJ7 proves itself to be a fantastic choice. What’s more, for the price of only $9,999 or as low as 322.60 per month (via 0% financing), you can enjoy the endless benefits of massage therapy, right in the comfort of your own home. It also comes with a 3-year manufacturer warranty for your complete peace of mind. We are entrusted by Panasonic as one of the exclusive online dealers of this model. So, if you are ready to capture the essence of style balanced by remarkable performance, inquire now, while our stocks last. Click on the add to cart button above or just dial 888-612-8862 now.